you may remember Michelle from our Peoples Project video as she is the disabled entrepreneur who is setting up an Events company. We have also been working with her son, Shane, and he too has set up a small business offering printed corporate gifts ... we already have a teddy bear, coaster, glass tankard and so many other bits ... it is a real family business and we are proud to be part of it. Film of The DEBSS Project will be aired on ITV and viewers can vote on this year’s worthy winner. A local community group in Bournemouth is calling for your vote to secure £50,000 of National Lottery funding as part of this year’s People’s Projects. 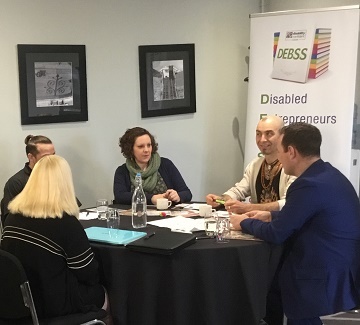 The DEBSS Project, which is based in Bournemouth and which supports disabled people explore self-employment, is one of five groups in Meridian West in the running for a share of up to £150,000 of funding. Now in its 13th year, the Big Lottery Fund, ITV and The National Lottery are teaming up to give the public a chance to decide how National Lottery funding should be put to good use in their local area. Designed to celebrate some of the incredible projects the Big Lottery Fund has supported over the past year, 95 community-based schemes are now shortlisted across the UK. In each region, the three with the most public votes will receive grants of up to £50,000. This will help them to continue their work to improve local people’s lives. The entire amount up for grabs across the UK is a life-changing £3 million. On Monday 16th of April, the SAMEE Charity will showcase its project, DEBSS on Meridien West ITV regional news at 6pm. To be in with a chance of winning, The SAMEE Charity is calling on viewers to support its bid. Voting opens at 9am on Monday 16 April at www.thepeoplesprojects.org.uk. If successful, DEBSS will use the grant to help more disabled people take control of their lives by starting their own business. Since 2005, around £39 million has been awarded through the Big Lottery Fund, National Lottery and ITV/STV partnership to 865 Good Causes across the UK. Voting closes at midday on Monday 30 April 2018. People can vote once per region and will need an email address to vote**.